Every January, millions of people resolve to lose weight. And every February, millions of people forget, ignore or give up on their resolution. Dreams of a smaller waistline, broader chest, defined muscles and a healthy heart get swallowed by lack of energy, lack of motivation and too many desserts. With 35% of Americans ages 20 and up being obese or overweight, according to the Center for Disease Control, clearly our society is losing the battle of the bulge. Why? How come men can’t — or won’t — shed the flab that holds them back? 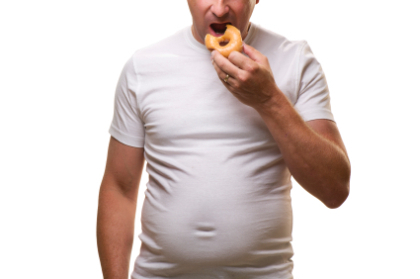 Why do men prefer to be fat than fit? I believe it’s a spiritual battle played in the arena of our physical mind and body. As we plow forward into 2014, here’s God’s Affordable Healthcare Plan so we can augment the new Affordable Care Act that will surely affect our ability to obtain medical care. Here it is, ready? Just say “No” to bad habits. Just say “Yes” to good ones. Selfishness. It’s selfish not to be healthy. I believe the enemy literally wants to weigh us down, and he uses our own selfish desires for large portions, sweet treats, fast foods and lazy living because we’re tricked into believing “we deserve it.” Bag the discipline. Grab the donuts. Self trickery always works because the person asking and answering the question is YOU. WAKE UP MEN! The enemy is counting on us to make selfish, entitled decisions so that you lose your long-term dreams. What dreams are those? Time! Time with your spouse. Time making memories with your children. Time for vacations. Time to provide for your life, family and future. And, most importantly, time to grow a relationship with God and share His hope and love with others. In 2 Corinthians 4:10-12, we see that we are to reflect the life and death of Jesus in our mortal flesh. In my own life, I found the sole key, the secret to a life of health and well-being is motivation. Without it, we remain on the couch chomping chips and flipping channels to block from our minds from what we should be doing. But with motivation, comes a lifestyle. 1. You have to be a leader people want to follow. It’s a fact, regardless of my message or how well I share it, within seconds men make up their minds about whether or not they’re going to listen to me. The same is true for you. You have to be someone others will want to respect, honor and follow. For example, if you want your children to be healthy, but you exhibit behaviors more life a sloth, your children are more likely to copy your actions, than your words. You can’t expect them to be disciplined if you’re not. Your appearance matters, but not so you can look like a model for a Men’s Health magazine or score with the women. Rather, our appearance helps our message be received. And our message, ultimately, is that God saves. 2. You need energy to lead. Our physical bodies require energy to support blood and brain flow. To get off the lounge chair, your muscles have to move. If you don’t have the energy, you’ll sit right where you’re at. Eat right, get moving and you will have more energy. Leading requires energy. Energy sustains energy. You are a leader, whether you realize it or not. You’re leading your family, and you’re leading others to a relationship with Christ. You may not be a manager or CEO, but you’re setting an example for others to follow. 3. Enjoy the “fruit” of self-control, instead of leading with selfishness. I encourage you to meditate on this passage, thinking about how you can love God with all your heart, mind, soul and strength and then how you can love others as yourself. This is transformational, and the fruit will give you strength to say no to the treats, and yes to an exercise program. One final piece of advice: If you’re just starting out, or think you feel great and don’t need to change your health. Go see a doctor. Get a physical and blood work. Ask your doctor to explain the health risks you are facing. Then, come back and re-read this article. For the sake of your children, your family, your hopes and dreams, have a healthy 2014! Kenny Luck, founder and president of Every Man Ministries, is the men’s pastor at Saddleback Church, and has a great deal of experience in leading men through their walk with God. His program Sleeping Giant empowers men to take the experience of a men’s ministry and bring it to their own communities. Watch Kenny’s teachings at EveryManMinistries.com and start your men’s group today!